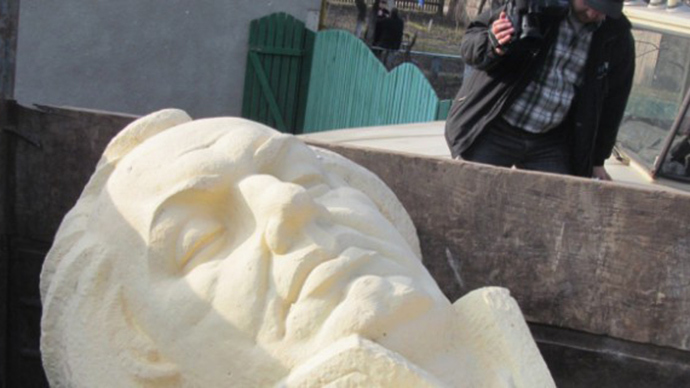 One of the biggest monuments to the Bolshevik Revolution leader Vladimir Lenin has been toppled in Ukraine’s second largest city of Kharkov by “activists” who had gathered in their hundreds to watch it being sawn down waiting to get pieces as souvenirs. As the symbol of communist past was being demolished in the center of Kharkov by the country's ultra-nationalists, the event was broadcast via live internet stream by a number of channels. Around three thousand activists answered the call “Kharkov – it's Ukraine” and gathered on Sunday evening to demonstrate their support of the authorities in Kiev. After the main procession, a group of activists with blue and yellow Ukrainian flags and nationalist red-black banners gathered at the center of the square in front of a monument to the icon of the communist movement, Vladimir Lenin. A few of the men managed to climb the tall statue to write out “Glory to Ukraine” as well as a Nazi Wolfsangel symbol, which Ukrainian ultra-national "patriots" claim to actually be the crossed letters N and I, meaning "national idea." Another group of men with the flag of the volunteer battalion Azov and the Ukrainian flag climbed the ladder to the monument and using a grinder began sawing off his leg. 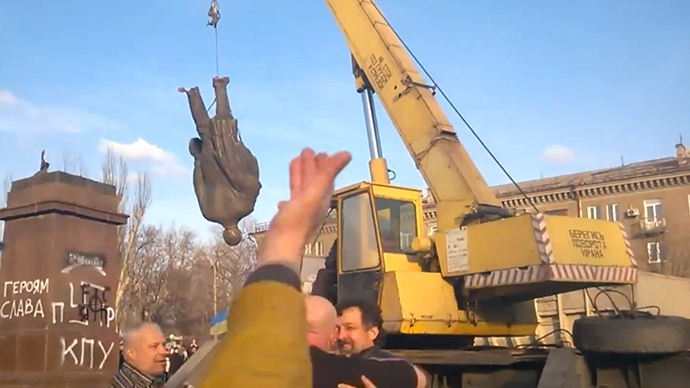 As the monument of Lenin came down, many people cheered, as the former communist leader is seen by many in Ukraine as an undesired link with Moscow. Others voiced anger over the decision to destroy a monument that many see as insult to the country’s past, but that was mostly online, hesitating to intervene after police on Saturday detained several dozen participants of the anti-war march labelled by authorities as separatist. However, most people in the excited crowd rushed to the ruins as the statue fell to collect a small piece of the once powerful symbol to take back home with them. 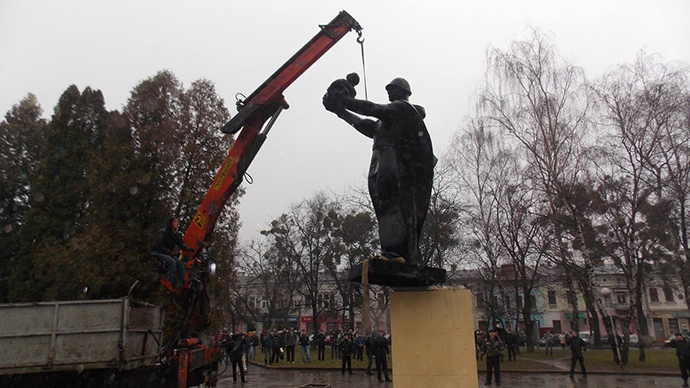 However, Ukraine's Interior Minister Arsen Avakov sees nothing wrong or criminal in this act of vandalism and said the criminal case was closed since the governor swiftly issued an order to demolish that monument. Law enforcements were given orders “to protect the people, not the idol,” Avakov added. 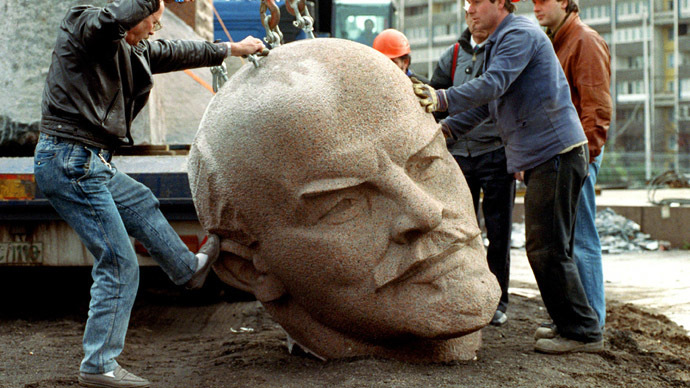 “I have instructed the relevant authorities to take measures to get rid of the statue of Lenin from the register of monuments of history and culture, as well as to take measures to dismantle the monument,” the head of city administration Igor Baluta said, according to Ukrinform. Currently the area around the monument is cordoned off by police with “guns and tear gas,”adviser to the Interior Minister Anton Geraschenkosaid, as quoted by rrnews.ru. The authorities warn not to use the“fragile political situation”for political gains. Instead of Lenin, Gerashchenko says, authorities should erect a monument to all the heroes who fought and died for the independence and unity of Ukraine. “... both to those who did centuries ago, and the Heroes of the Heavenly Hundred and thousands of our soldiers who defended their homeland now in a fight with Putin's Russia,” he wrote on his Facebook page. The following morning, residents of Kharkov arrived at the site of the statue's felling to pay their respects to the space formerly occupied by Lenin. Some residents lay flowers at the base, while others attempted the clean off the graffiti from the site. 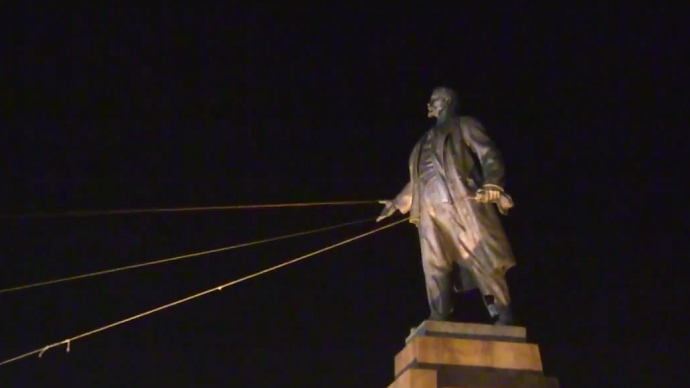 According to one US eyewitness, all Ukrainian flags had been removed from the statue by Monday.